Daniel Rudin, a Ph.D. student in film and digital media at UC Santa Cruz, speaks about Santa Cruz’s housing crisis. The meeting discussed many aspects of housing, from houselessness to student housing to rising rent in the county. Photo by Jasper Lyons. Sixty people gathered at Kresge Town Hall on Nov. 18 to participate in the first public forum on the Santa Cruz housing crisis. The Student Union Assembly, Graduate Student Association and UC Student-Workers Union collaborated with local community organizers on this event to illuminate a failing housing situation in Santa Cruz County and at UC Santa Cruz. 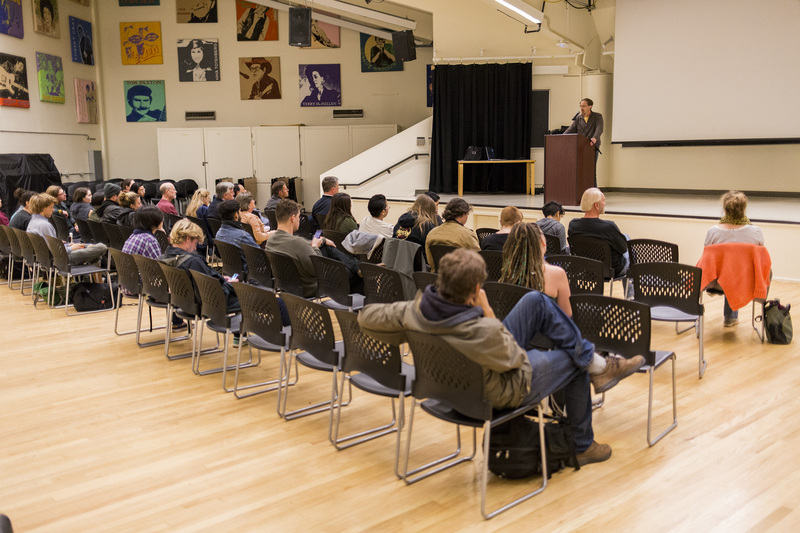 The forum addressed the increasing lack of affordable housing, the decrease of resources provided to houseless individuals in the county and how these issues correlate with UCSC’s growth. “We are not in a housing crisis, we are in an emerging catastrophe with housing,” said task force member of Affordable Housing Now and former mayor of Santa Cruz Bruce Van Allen at the forum. Van Allen served on the Santa Cruz City Council from 1979-1983 and as mayor in his final year. Some of the organizations that attended the forum like Freedom Sleepers and Homeless United for Friendship and Freedom (HUFF) work to repeal the camping ban in Santa Cruz and end the criminalization of people enduring houselessness. People are prohibited from camping — defined as sleeping, setting up a bed from 11 p.m. to 8:30 a.m. or setting up a campsite at anytime — in the city, whether on public or private land. In a Santa Cruz City Ordinance, HUFF estimates there are currently 2,000 unsheltered people in Santa Cruz County whose only option is to camp, knowing they will be punished for it. Colby said a lot of people become houseless due to drug and alcohol addiction. According to a study conducted by Santa Cruz County’s Homeless Services Center, 53 percent of houseless individuals in the county have health conditions like addiction and traumatic brain injury. Of those 53 percent, 35 percent of individuals have physical disabilities. Such disabilities contribute to the loss of jobs and inability to pay rent. Colby said it is the city’s duty to stop the unjust treatment of houseless people, like arrests and harassment, by drawing awareness to the unconstitutionality of taking away someone’s right to sleep. “The inability of our society — capitalist society, industrial society — to have workers afford to be able to pay the costs of their housing, means we have to regulate the market or have higher wages,” Van Allen said at the forum. Van Allen said to improve the housing crisis, the city has to implement measures such as rent control and regulate markets. These measures can prevent over-priced rent and landlords who evict families to replace them with UCSC students who can pay more. He called for the city to build more smaller and affordable rental units in the county. Cynthia Berger, who works for the Santa Cruz Tenants Association, talked about the impact universities have on cities, where the constant influx of temporary residents affects prices for permanent residents. She cited an example where a house previously occupied by 10 UCSC students was modified by a landlord to accommodate 17. The house’s rent went up to $11,500. Berger presented a letter directed to the UCSC body at the forum, written by Jamie Leigh Kahn, a concerned community member. The letter expressed concerns about the rise in eviction rates of long-time Santa Cruz tenants and the price gouging of the housing market.